Wolves of Odin: Werewolves vs. Vikings! Werewolves and vikings, together at last! In a move seemingly inspired by a heavy metal song (but actually inspired by a wander through Barnes & Noble), comic illustrator Grant Gould is working on a graphic novella titled Wolves of Odin. …I took the idea of the wolves from the berserkers. Berserkers were ferocious Norse warriors that would run into battle howling and roaring, and they would cloak themselves in the fur of bears and wolves. Men and women would fear them and think that they were truly half-animal, and a lot of people believe that that’s where the whole werewolf legend originated. In my comic, the gods and magic are very real, and Odin’s got a beef with mankind. His followers are starting to discover Christianity and turn their back on the old ways, and this pisses him off. He chooses his three most loyal berserkers and transforms them into beasts. They are his servants, sent out into the lands of men to destroy and punish. The wolves become a physical extension of Odin’s wrath. If you think this sounds completely awesome, you are thinking correctly. Wolves of Odin is being published by Super Real Graphics, and should be out this November. In the meantime, Gould and Super Real are taking a very fan-centric approach to the project’s publicity. Gould maintains a Wolves of Odin blog at wolvesofodin.com, where he posts updates, previews and character bios. He’s already featured Fenrir, the leader of the werewolf pack. Also of note is the official Wolves of Odin Fan-Art group on DeviantART. Fans can submit their own artwork inspired by Wolves of Odin, and Gould posts them in the group’s gallery. Take a look— there’s already some pretty great stuff posted. 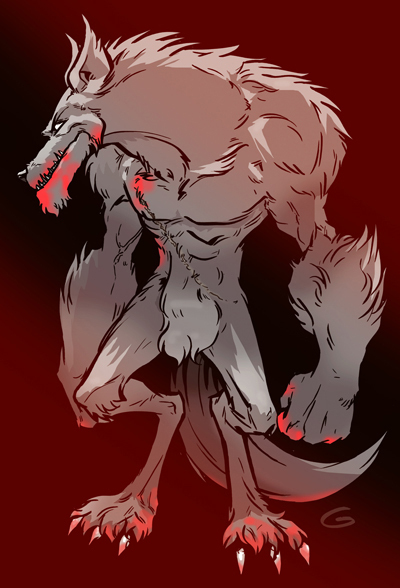 I’ll end this longer-than-usual post with another piece of Gould’s werewolf artwork. Remember, if you dig what you see, be sure to order a copy from Previews magazine in September, or check your local comic shop in November. Enjoy!